Lone Elk Park? I’d never heard of it. It’s in Valley Park, Missouri, a little west of St. Louis. Here’s how we ended up there: I realized a few weeks back that I had a couple of unused Personal days in the bank at my day job, and the deal with those Personal days is that I have to use 'em or lose 'em by the end of the year. Holiday time wasn’t an option so I picked a Monday and Tuesday in early November to give myself a nice long weekend in which to… do something. It needed to be something modest and unambitious. After some looking around, we agreed on St. Louis, Missouri, less than a day’s drive from Chicago. Our general plan offered the myriad diversions of St. Louis if we opted to pursue them, and our cabin twenty miles west of town offered peace and quiet if we opted not to pursue them. We were driving into St. Louis on I-44 when we saw the sign at the top of this post. The photo was shot through the windshield of a moving car, which is why it looks the way it does. 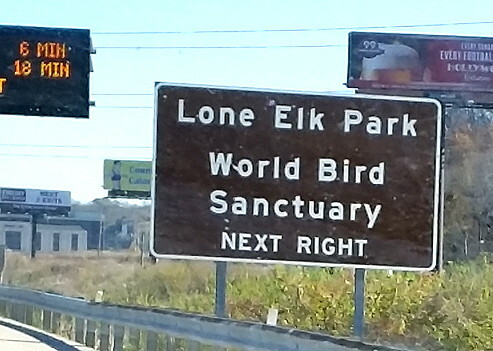 World Bird Sanctuary? Well heck, we both love birds! I asked CC if she wanted to go. “Sure!” she replied. Half a mile later, I exited and began to follow the twisting roads that the signs pointed me along. After a few miles, we began to wonder if this wasn’t a wild goose chase (though that would have been appropriate for a bird sanctuary), but we pushed on. Just in case you’re reading this in the dark and can’t see the photo, that’s a bald eagle. Well damn! I’d never been anywhere near that close to such a creature. And this shot has been cropped a bit but it was not taken with a zoom lens; we really were that close. 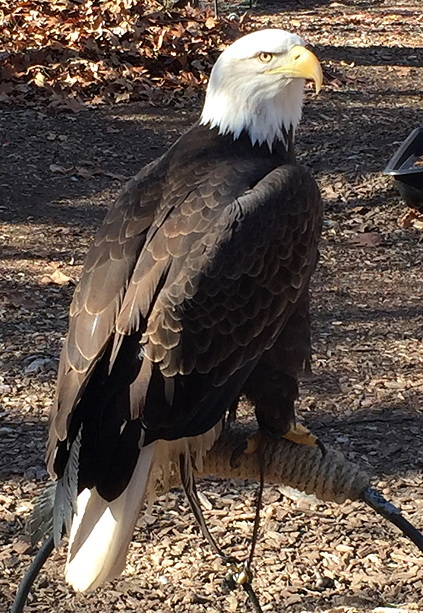 He is tethered to his perch, and while he can jump on and off of it and move around a bit, he can’t go very far when he’s on exhibit. In case you’re wondering, a great many of the birds there are animals that have been injured to an extent that they could not survive on their own. We finally found a docent who was able to fill us in on the scope of the place. 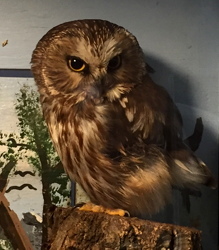 There are dozens of birds there, mostly kept in screened outdoor enclosures. Seeing the whole place requires walking a mile or two, which we gladly did. Oh gosh – we saw hawks, owls, turkeys, several varieties of chickens, crows, ravens, even an Andean condor with a 12-foot wingspan fer Chrissakes! I didn’t take pictures of any of the ones in enclosures simply because I didn’t think they’d look very good being seen through wire screening, but they were a delight to see and get close to. The building that housed the gift shop also contained animals, including a rabbit (which we were allowed to pet) whose fur was almost unimaginably soft. It also contained several talking parrots, though they had little to say to us. There are a couple of additional points I want to make. First of all, this is a modest facility. As I said, admission is free but donations are gladly accepted – and we gladly made one. If you walk in the door expecting something Disney-fied, you’re going to be disappointed, but if you walk in ready to accept it on its own terms, you’re going to be delighted. Great fun for the whole family & kids of all ages. My other major point is that this experience was the happy result of not having everything planned out ahead of time. I'd looked at various St. Louis tourism guides before leaving Chicago, and none of them mentioned the World Bird Sanctuary, but in fact, I’d make it a point to stop there again the next time I’m in the neighborhood. One final minor point: This photograph. I don’t have a story about it, but I liked the bird and I like the photo. 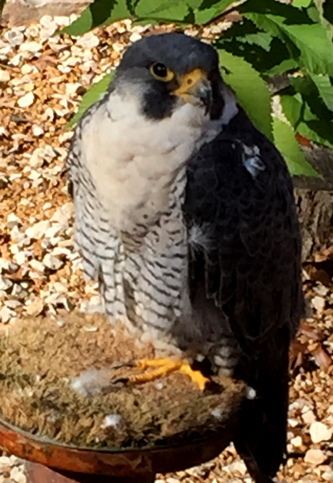 It’s a peregrine falcon. Enjoy.